Here are some top best jailbreak tweaks for Control Center for iOS 11, 10, 9, 8 or below that you should install right on your iPhone-iPad. add if your device is jailbroken. There are tons of jailbroken control center tweaks available in Cydia that you can install on your iOS 11 or 10 devices. 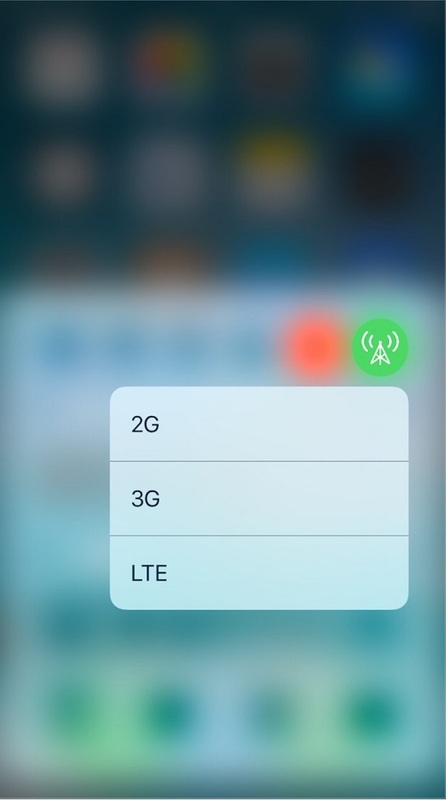 CCDataMore: is control center tweak for iOS 10 which enables more Cellular Data options with 3D Touch. CCDataMore is free which supports 3D touch devices. CCRecord (iOS 10): is a jailbreak for iOS 10, 11 control center which allows you to record your screen with only one tap on a button in Control Center. CCRecord (iOS 10) also support FlipSwitch and when recording you’ll see a small icon in the status bar. 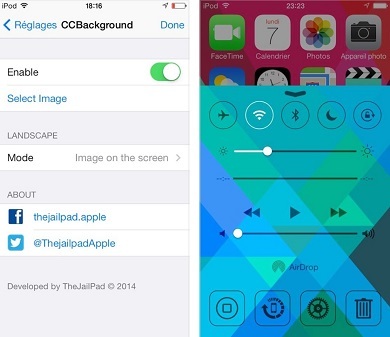 CCSettings: is a jailbreak tweaks for iOS 7, 8 and 9, 10, 11 control center. CCSettings add more toggle for control center like Mobile Data, Low power mode, Home, VPN, and Personal Hotspot, Respring, Shutdown, Reboot and more including all default control center toggles. CCSettings is compatible for iOS 7, 8 and 9, 10, 11 and is available for free in Cydia’s BigBoss Repo. CCMore: is a control center tweak which adds new features like timer, calculator, camera, notes etc. directly in Control Center. CCMore is available for $1.99 from BigBoss Repo and is compatible with iOS 8 and 9. 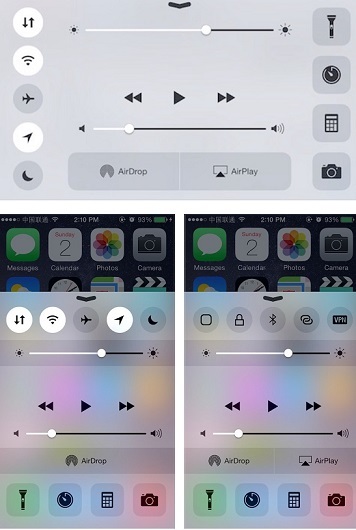 CCSmoothSlider: is a free control center jailbreak tweak which removes the ugly slider for brightness and volume on control center and replaces it with a clean new one. CCSmoothSlider is compatible with all iPhone, iPad and iPod touch. 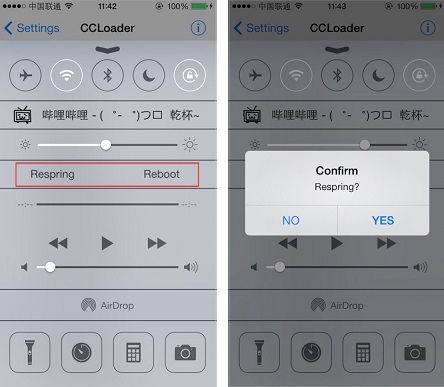 CCRespring: is a free iOS CC tweak that enables quick respring or reboot in your control center. CCMeters: is a lightweight system information widget for the Control Center. It requires CCLoader to be installed. Meters are customizable where you can change icon and value colors also. 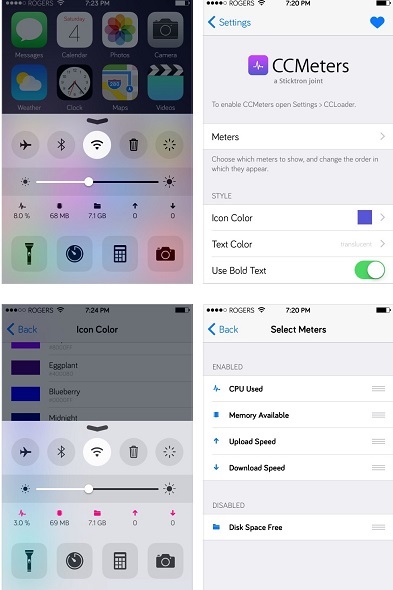 CCMeters is available for free via BigBoss Repo and is compatible with iOS 7, 8 and 9, 10, 11. 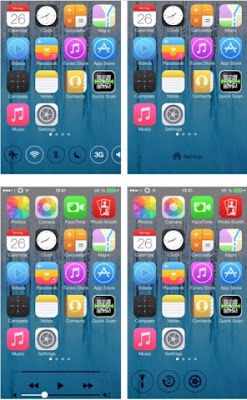 CCBackground: is a control Center tweak which lets you changing control center background from your Camera Roll. CCBackground is free in Cydia and supports iOS 8 and 9, 10, 11. CCClockOpenToAlarm+: is a jailbroken cydia tweak for Control Center that open the alaram sections instead of the timer. CCClockOpenToAlarm+ is compatible and is available for free in Cydia’s BigBoss Repo. 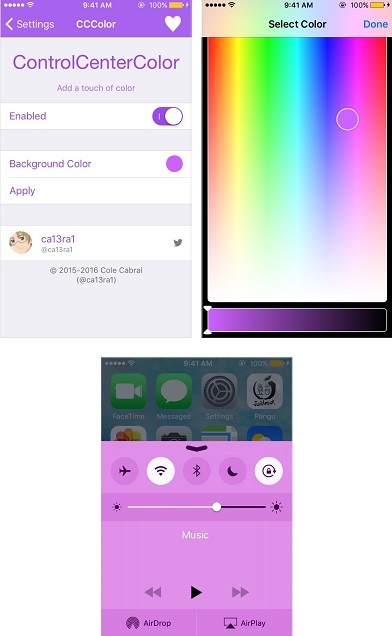 CCColor: CCColor lets you change the control center color with your own custom color. CCColor supports iOS 9 or later and is for free. CCDock: is an awesome control center tweak which allows you to have all your control center in your dock. After installing, you can swipe through different sections of control center in your dock view. CCDock supports all iPhones and iPads running iOS 7 and 8 and may be partially works on iOS 10 or later. CCDock is available for $1.49 via BigBoss Repo. 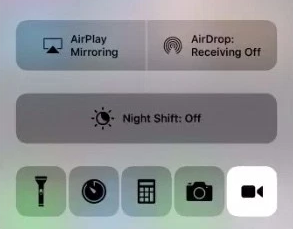 CCFlashLightLevel: is a jailbreak tweak for control center that lets you adjust the LED flashlight level directly from the Control Center using its Torch button. CCFlashLightLevel is compatible with iOS 7 and 8 & may be partially supported iOS 9 and 10 which is available for free. These are the best iOS 10, 9, 8 or 7 jailbreak tweaks for Control Center, among all above tweaks please choose your favorite Control Center tweak and install on your iPhone-iPad. If your device is not yet jailbroken then here’s how to jailbreak your iPhone on iOS 10.2, 10.1.1. Please let us know in the comment sections if there is any other control center cydia tweak you are known with.